Apron Feeder | Product Information | KURIMOTO, LTD.
Kurimoto’s Apron Feeders offer a wealth of variations that meet diverse applications. 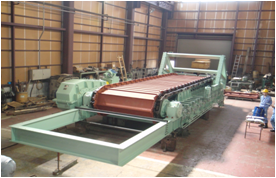 Allows for stable continuous operation with some leeway even under harsh conditions. 1）The performance shown above is related to the case where raw materials of apparent apecific gravity 1.6t/m3 are continuously supplied.The conveying capacity and the output of motor increase according to the length of machine and the apron speed. 2）As a rule, this machine employs variable speed operation. 3）Motor output（kW）includes efficiently of reducer,variable speed gear and transmission. 4）Inclination angle is standardized at 8° overhead. 5）Grizzly opening shall be set to the thickness of feed size.